Comment, Moderation, and Disclosure Policies | Andy Sernovitz | Damn, I Wish I'd Thought of That! I work hard to make this a great blog, and I’m glad you’re here. You are invited to comment, and I look forward to hearing what you have to say. Comments are open but I’ll delete those that are off-topic, spammy, overly self-promotional, abusive, inappropriate, or uncivil in any way. You can say what you want on your own blog, but you can’t use mine unless you’re cool about it. My comment form isn’t a place for you to advertise. If you abuse it, there is a good chance that I will publicly make fun of you. Feel free to debate or disagree with me, but please identify yourself as I do here. It’s hard to have a good conversation with someone hiding behind an alias. Anonymity has an important role online, but it also empowers anyone who wants to disrupt and destroy a conversation without contributing. Disclosure forces people to be honest and take responsibility for their own words. There is a detailed disclosure statement for all of my companies, projects, and websites here. I own a company called GasPedal, which operates SocialMedia.org and WordofMouth.org. Lots of people pay me for advice. I like that! You can see my client list here, which is reasonably current. I shamelessly and proudly say really nice things about them. These organizations pay me to make speeches. I say nice things about them too. You can assume that at any given time I’m trying to get more clients, and that I’ll say nice things about people that I want to impress. 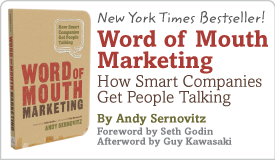 I used to be CEO of the Word of Mouth Marketing Association, but I do not work there anymore. I do not speak for them or their members in any way. People often send me free stuff because I’m a word of mouth talker. I disclose clearly where it’s relevant and reasonable. But how often do you need to hear that Dell gave me an awesome computer in 2007? All content on this site is copyright GasPedal and Andy Sernovitz, all rights reserved. GasPedal is a registered trademark. Please link back to this site and give us full credit for anything that you quote.